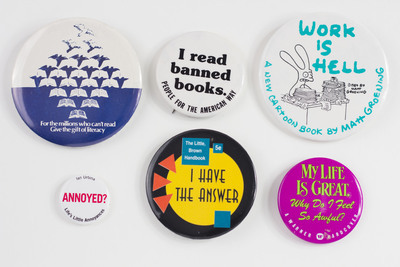 For the millions who can’t read Give the gift of literacy button. I read banned books. People for the American Way button. Work is Hell A New Cartoon book by Matt Groening button. Annoyed? Life’s Little Annoyances Ian Urbina button (mini). I Have the Answer The Little Brown Handbook 5e button. My Life Is Great. Why Do I Feel SO Awful? A Warner Hardcover button.